That graph made me LOL! It's exactly how I'm feeling right now. I just told Tab yesterday the medicine doesn't even make me want to sleep-it makes me want to just close my eyes. My eyes hurt. They feel better if they're closed. ha! 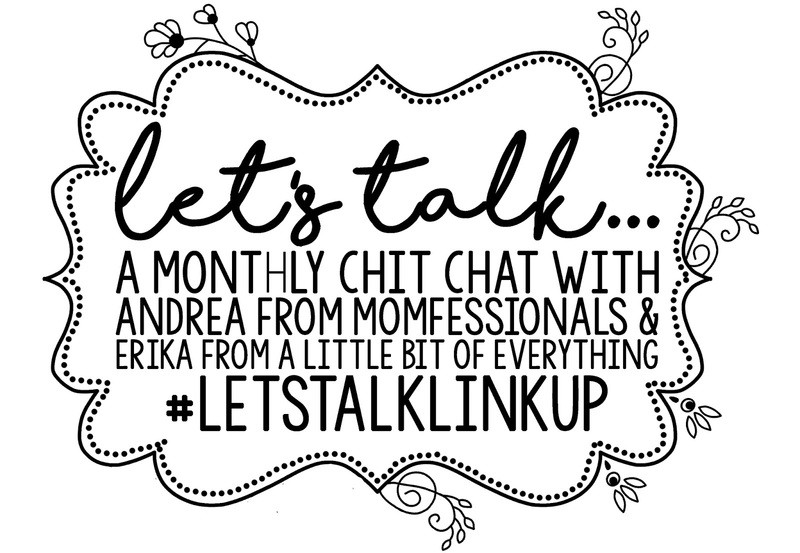 I'm joining my girls, Andrea and Narci, to share some Friday Favorites. This picture is crazy blurry, but I cropped out every kiddo I didn't have permission to post-which only left two! 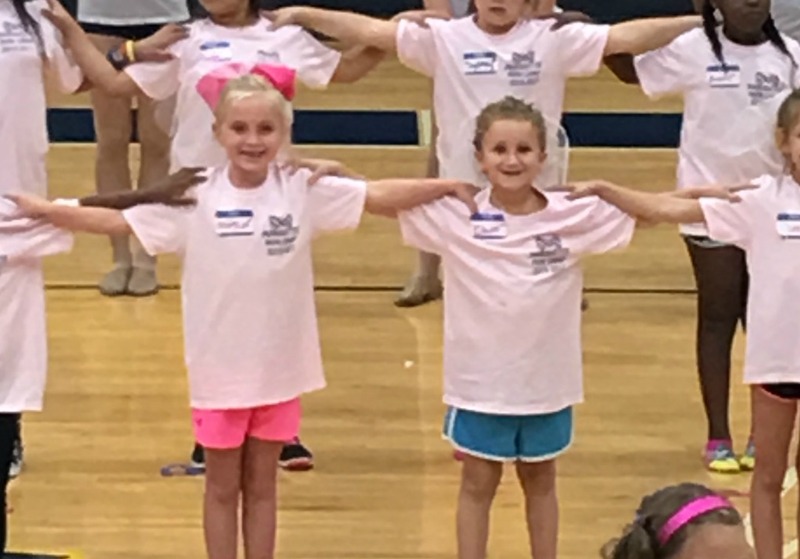 Last weekend, Ebby Lee and a friend went to a local high school's drill team clinic. I dropped them off with big smiles and picked them up with even bigger smiles. They had so much fun! Watching their dance performance was a FAVORITE! This girl was STOKED about her Starbucks cup. haha! She is a mess, but her personality is my FAVORITE. She is ME as a seven-year-old! When I picked the big kids up from school this week, I told them we were gonna drive through Starbucks. I usually make an afternoon cup of coffee and this particular day I couldn't get to the coffee pot. Our garbage disposal was leaking and we had NO clue until our hardwood floor started buckling. The guy came to take out all the wet pieces of wood and had the kitchen all taped off. When we got home, it looked like this! I'm so thankful the floor started buckling when it did or it'd still be leaking. Our kitchen is a bit of a disaster right now, which isn't a FAVORITE, but no leaky water under the sink sure is! I teamed up with Fancy Ashley to host a FALL GIVEAWAY! Giveaways are my FAVORITE! It's a good one! You can enter here. The sign crew was representin'. They looked GREAT! THEY MADE IT! WAHOO! Welcome Home, Madeley Shull! Oh my goodness! That baby is precious! These two melted my heart! Bowen missed Ashby with his whole heart. #ithinkthefeelingismutual He loves that girl, so they were pumped about seeing each other. All the kids were hugging. Everyone was hugging Shay and gazing sweetly at Madeley when Tab went in for a hug! haha! Andrew looks a little nervous in this picture. Andrew was just kind of standing there taking it all in and didn't see it coming. Everyone was laughing. It's probably hard to explain in words, but it was funny! The girlfriends were in attendance! I'm so glad to have these ladies in my corner. We're so incredibly happy for these six! Having such faithful friends who are the hands and feet of Jesus is such a blessing. We're so thankful to have this group in our lives. A FAVORITE moment from the week! It's college week at the big kids' school and yesterday was "Your Future's So Bright"-wear neon day. A FAVORITE for Nixon. His closet consists of pretty much only neon. 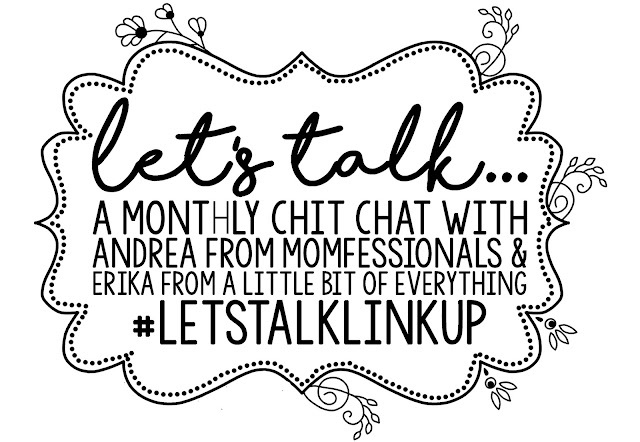 On Monday, we're chatting all things ENTERTAINMENT! Share books, movies, television shows, and more. You should join us! Seeing you guys was a FAVORITE of ours this week!!! We're so happy to be back home with your sweet family! That picture of Ashby and Bowen is THE cutest thing! Seeing your kids so excited about their besties getting home was a favorite of mine for sure! Three drops each of lemon, lavender and peppermint either with a little water or in a capsule has changed how we deal with seasonal allergies. My son was taking adult doses of OTC allergy meds and it did nothing for him. I don't sell oils, just a very faithful user of them. The best thing ever...no side effects! Those pictures just make me tear up all over again! So happy to have them back home! Also, love the picture of Ebby Lee at dance camp!! What a sweet girl!!! The Shulls are home. Bowen and Ashby are cute. Bowen and Ashby's reuniting is so precious! Have a great weekend! So very glad I got to see you guys this week! I loved getting to experience their homecoming with y'all! Have a great weekend friend! Have you tried essential oils for your allergies? I swear by my roller of peppermint, lemon, and lavender. And then diffuse RC or any of the Eucalyptus oils at night. I know Narci had a kit. Maybe she would be willing to let you try something? I'd be more than happy to send you some samples too! Brandi- great minds think alike;) I love that combo of oils! And seriously how cute is Madely?!! I have loved following their adoption journey! Awkward man-hugs are a favorite for sure! 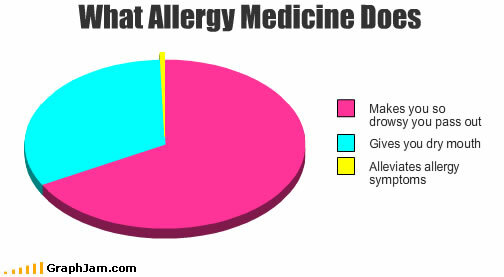 Allergies are the worst. Sorry you are struggling. Last week I thought Anderson's allergies were just flaring up as usually in the fall when it turns out he had pneumonia! Bowen and ashby! Ahhh true love right there! Ashby running to him in that picture just melts my heart! Happy Friday! 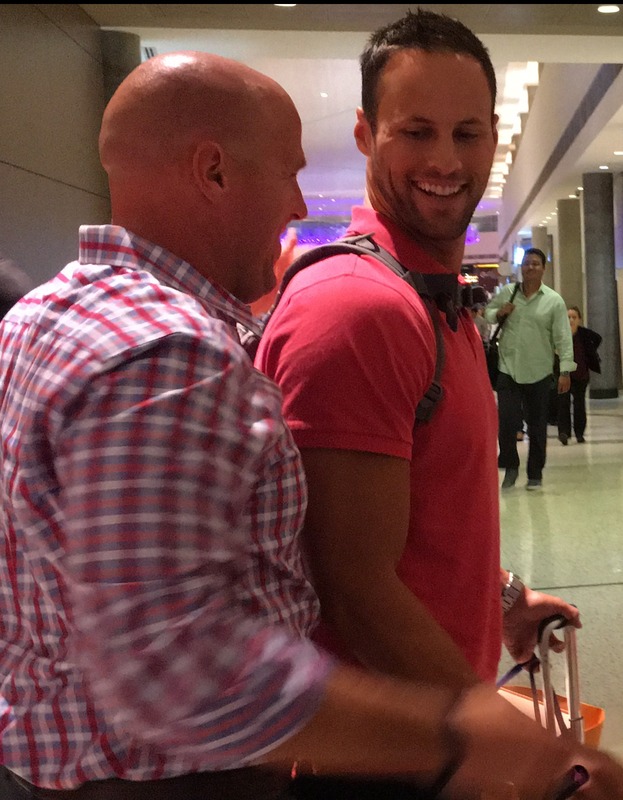 Loved your favorites this week, ESPECIALLY the Shull reunion at the airport! I wish I lived in Texas to get to be part of such a great friend group!! ;) You guys are all adorable! I feel your pain with the leak on the wood floor in the kitchen. We had the same thing happen in our house in Atlanta, but it was a slow leak from the dishwasher. :( I just have to admit that the picture of Ashby and Bowen with her hands on his face completely melted my heart and brought tears to my eyes! Your Friday Favorites is definitely one of my favorites! The picture of Ashby and Bowen is the sweetest thing ever!!!! And Baker's allergies have been sooooooo bad lately. Sorry girl! Hope you start feeling better soon! These pictures are the best. Ashby and Bowen's little friendship is so sweet. Their greeting for each other had me tearing up. Not to mention Lovie and Papa Jay so excited as well! And Kensington's group hug with her girls. You guys give me all the feels. What a special moment for everyone. My favorite is actually Andrew and Tab....Tab was pumped to get to have his buddy back too. Love it! GIRL! 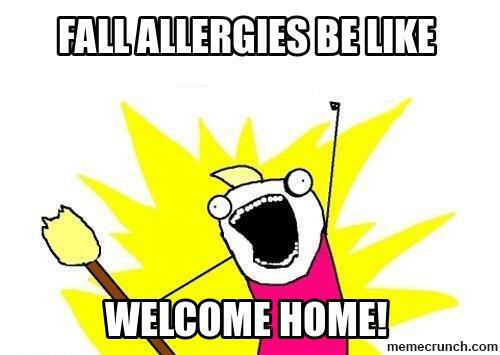 I can't believe that I've finally found a fellow fall allergy sufferer! NOBODY here has fall allergies except for me so everyone always thinks it's so weird that I'm suffering right now. Haha. 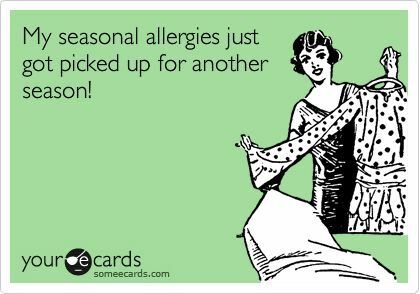 It seems everyone else has spring allergies. And YES, it's making my eyes hurt SO BAD which is also causing my head and jaw to feel strained and hurt. I've been closing my eyes at random times throughout the day because it feels so good to relax all of my face muscles. Lol. And just like I commented on Andrea's page... that picture of Bowen and Ashby is just so sweet!! So many great things in this post! Hope your allergies & kitchen are all better soon! Ebby Lee & her Starbucks cup crack me up! Bowen & Ashby melt my heart and that photo of Andrew & Tab is too funny! Our ice maker started leaking once and it went under the wall into a coat closet instead of back into the kitchen. Since the coat closet had carpet it was a really long time before we knew and that's how I found out....I was walking through the entry hall and the water was seeping through the wood. Eek....by that time it had affected a really large space! omg Ashby and Bowen are darling!! such a sweet pic of those two! Sorry about your floors :( never a fun thing to deal with. We had it happen in our guest bathroom and had to replace them. What an incredibly moving moment you were able to capture in pictures (at the airport). Very touching. Best of luck with the allergies. I'm in KY and they are gearing up here as well. Have a great weekend! That picture of Ashby and Bowen is adorable!!! Ashby and Bowen are so precious! Random, but I'm watching my Pokes play Baylor tonight and I keep seeing Tab! I feel very much like I know that guy after following your blog for so long! Loved your kids' signs for their Shull friends coming home!!! I guess maybe you should have made one for Andrew for Tab to hold. LOL!!! But most of all that picture of Ashby and Bowen gets me every.single.time. I look at it!!! I just can't get enough of it! (hashtag not a stalker I promise). Entered the raffle! Thanks for doing such great giveaways!